I had Fons and Porter digital magazine going back to 2011. This update erased them from 2014 to 2011. I'm not happy at all. This app simply does not work. At all. I prefer digital subscriptions but had to subscribe to both paper and digital with this magazine. The paper copy is not worth all this aggravation. I am a print copy subscriber. I followed instructions received for downloading and logging in and the app seems to be working for me. Issues back to 2015 appear to be available to me. I do think you need to be a print subscriber for access. I am still not able to open after logging in with Apple ID. Since they updated the app I can not use it on my iPad. The iOS has to be of a a certain version or newer. Since this is an older iPad the app has become useless. Very frustrating even though I'm a subscriber through the Quilters Club. Tried calling and no one could help. Was referred to iTunes which of course I could find no contact information for. I'm going to delete this worthless app. Not sure if I can rate no stars, but will try. What's happened? I can't open my magazines anymore! Still waiting! It's been a month and my app doesn't work anymore! I'm having trouble downloading new issues. It wants my email as though I'm a subscriber. I have them on my iPad because we travel a lot and I can read them while traveling. I would love to get my May issue. I am having a problem getting my subscription. I receive the paper copy but forgot my password and there is no way to change it. I don't like that. When I can access it's a great app. Has anyone managed to get the digital version of the July/August magazine? I have the hard copy but can't get the digital one. I was happy to see this magazine on IPad, but I cannot login on IPad mode...I know my username and password are correct because I can login on my computer...you need to fix this problem! As stated in many of these reviews, I tried to resolve the app issues with F&P and was essentially blown off. This also occurred with their Quilty magazine app. Unfortunate as I like these magazines. Customer service should never be this poor. Regardless of where we got the app the publisher has a responsibility to insure their customers receive the product for which they paid. I cannot open any of my past magazine issues. What happened? The magazine is supposed to be on my iPhone. However, it is not showing up at all. I am a subscriber now for several years find it hard to believe that I can't get this also on my iPad won't let me sign in wants me to pay more money!!!! Really bad since I already pay and just want to enjoy while traveling with my iPad so much easier than carrying magazines... Fons and Porter you really need to handle this problem... No help anywhere I have email and called no answers!! Sorry no stars from me. 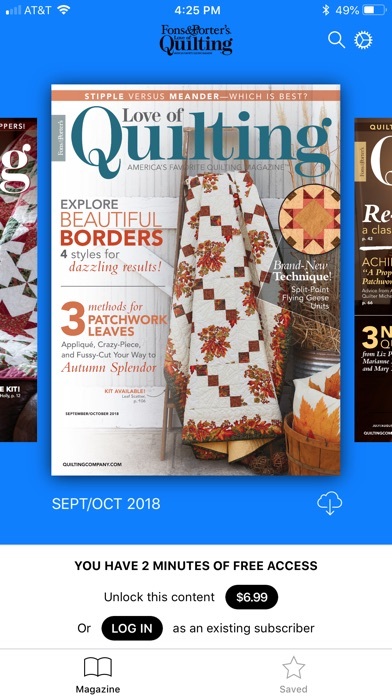 The blurb on Fons and Porter website says: "Print version fans of Love of Quilting can now get an iPad edition..." It doesn't actually say anything about print subscribers getting free access. I have a few print subscriptions of magazines for which New Track Media provides iPad subscriptions, and I haven't gotten answers to several emails requesting information on whether print subscribers can get access. I'm thinking that because the iPad editions aren't managed by the print publishers, the answer is no. 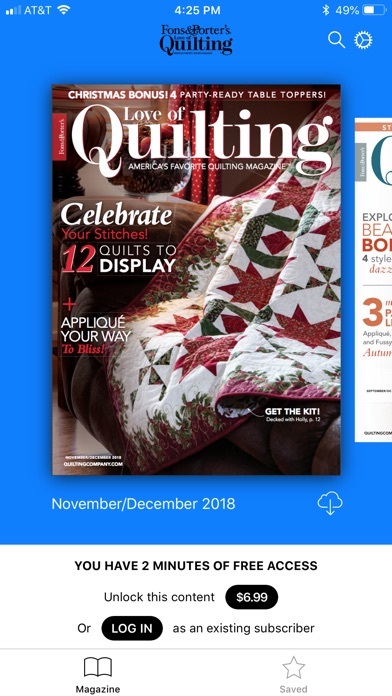 I subscribed to the iPad version of Quiltmaker Magazine, which is managed by this same company, and I'm not pleased with the interface as compared to that for other magazines, such as The New Yorker and Martha Stewart's Living. My issues are never in my library, and I have to restore them every time I want to read one. Also, there aren't a lot of navigation tools provided. The app does not work and patterns can not be printed. Tried contacting customer service but no response. This has been an issue since 2013 per previous reviews. Trying to download this app, and it got stuck mid-download. Still waiting for assistance, the website is no help. Thanks! It crap. This not for real you have to pay for everything you I surppose you are not going to print this review. Can't download May's issue. Is anyone else having the same problem? Should make it clear that we have to purchase digital magazine separately. I have three years left on my print subscription and do not want to duplicate for a price. Fons and porter is only out for money. There are no give aways. Sad for their loyal people. App keeps shutting down after renewing yearly subscription. Advised by F&P to delete app and reinstall and was assured I wouldn't lose previous issues...should be able to restore purchases right??? WRONG! I lost everything!!! F&P was clearly agitated his advice wasn't true and changed his pleasant attitude quickly. Immediately was referred to Apple since he assumed the problems were their problems. Wrong again. Will not be using the app anymore. I will not continue to lose my money and time with their app. Ok, I'm having the same problem as nearly everyone else. The app crashes constantly when trying to open an issue. I haven't been able to read any of the last 3 issues. Canceling my subscription. I too cannot log on but can do so on my computer. Please fix soon. I have subscribed both digitally and in print but can no longer access the magazine through the app. Waiting for an update. My new subscription says "Print version fans of Love of Quilting can now get iPad edition". But I cannot log in. Have the same problem as above - will not accept username and password on iPad but they work on my computer - shoulod not advertise the app until you know it will work! As others have said, "free app" is misleading. I don't do business with companies that do such things. Have I subscribed from F&P. I too cannot log on. Like the person above I can log on the web site but this app is not recognizing my sign in. This must be fixed. Until then since I can't use the app, one star. I just checked my account and can see my purchases - supposed to be one subscription for $20.99 and one separate purchase for $1.99 for a back issue. For some reason, there are also EIGHT purchases for $6.99 each that I know I didn't order. What's up with that? I thought I would like the digital version to cut back on all the magazines spread around the house. Hopefully, I can get this mystery resolved. If so, I'll write a follow-up review. Don't waste your money. You have to pay $6.99 for each pattern you want to download. Customer service very unhelpful and rude. I cannot access my magazine issues anymore. It crashes when I try to open. I deleted App. and installed again. Same problem. Just called F. and P. And spoke to Digital Support. Asked Trevor when they expected to take care of the problems others are also having. Will it be in a week, a month? He didn't have any idea. Apparently this issue has been going on for some time. No magazines included. I am guessing you need a subscription. Why would I do this when I can just google quilts? Still not able to d/l my subscription after purchasing 3 days ago. 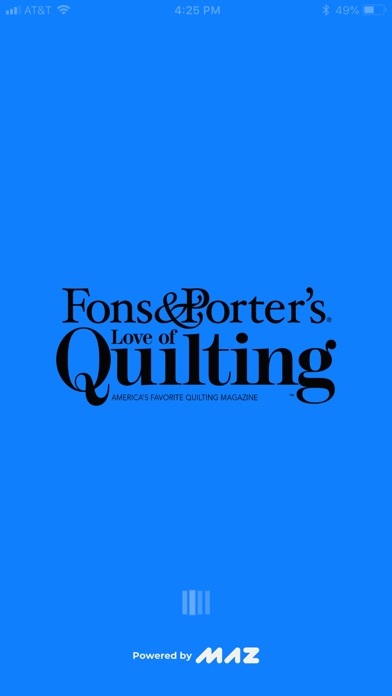 If you subscribe thru this app, you will get Love of Quilting via News Stand ONLY -- although the Fons and Porter website makes it sound like you can view it on a PC or Mac. There is a digital subscription option (cheaper by $4) that you can view via the Internet on any device. I can't see any way to print patterns from within News Stand, so that's pretty useless for patterns. I have had problems with downloading for the last three issues. I keep getting told I do not have a subscription which I do. The first two times the problem resolved itself. I accessed the lastest issue by doing a restore purchase. I will not be renewing. Very disappointing as I like the magazine.